Last week we announced our new community tree program--Trees Matter--and showed how it fits into the City of Phoenix’s larger goal of greening the city by achieving 25% urban tree canopy cover by 2030. Not only is the valuable role that trees play in reducing carbon emissions being recognized by city officials, but it has also become an important topic on the world stage--urban forestry investment was included in the final Paris climate agreement! 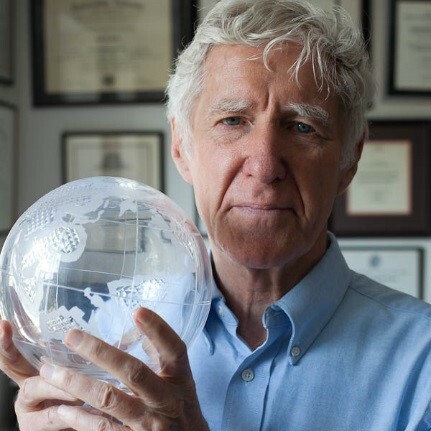 In 2014, we wrote this blog on environmentalist Lester Brown and his urging for the world to plant more trees. If you followed our Why Trees Matter blog series last year, you learned about the many other benefits that trees provide. One in particular--community development--has been the focus of a nationwide urban forestry program called Spreading the Canopy. In the US Forest Service sponsored initiative, five community forestry organizations worked to connect the health benefits that trees provide to the public health community. Their goal was to involve the health community into the greater conversation about the role that urban forests play in improving a person’s mental and physical health and the well-being of a city. By engaging others in the public health arena who would not typically be involved with trees organizations--such as hospitals, insurance agencies, municipal and state governments, and wellness organizations--a nationwide dialog began about how to develop and invest in more green spaces (parks, trees, grass) in order to improve public health. With the Paris climate agreement’s formal recognition of the crucial role that trees play in climate change and religious figures like Pope Francis joining the dialogue, the urban forestry movement is helping answer the world’s need for leafier cities. This year VPA is launching a community tree program called "Trees Matter" in order to increase public knowledge of permaculture and trees in the valley. 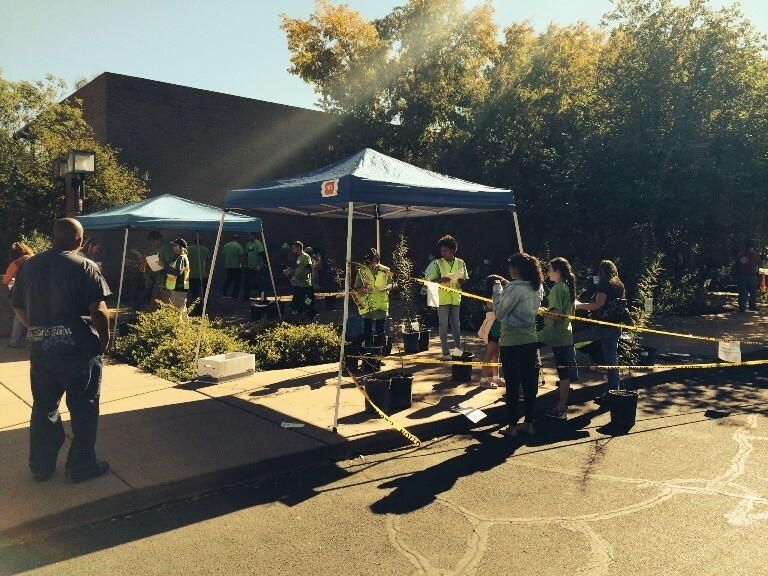 A large part of our efforts will be to educate others on why trees matter in the urban desert southwest. In a timely coincidence, Richard Adkins, the Forestry Supervisor for the City of Phoenix, was recently featured in this article where he discusses upcoming urban forestry projects aimed at increasing Phoenix’s tree canopy cover—the shade that we need when it’s 110ºF outside! 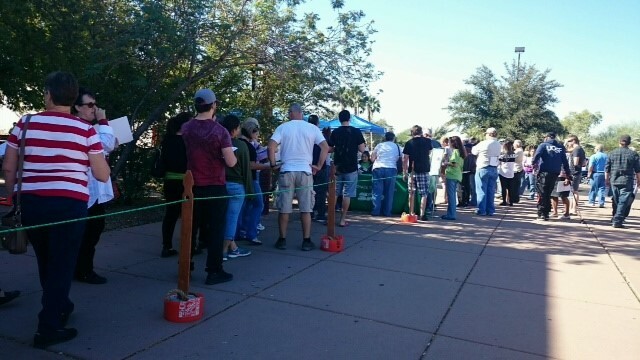 Last year thanks to those who participated in our SRP Shade Tree program and to the many volunteers who helped, we gave away 5,790 desert-adapted shade trees! This year with the help of a Community Challenge Grant awarded to us from the Arizona State Forestry Division, we hope to increase that number through our Trees Matter community tree program. We will also be partnering with the Arizona Community Tree Council and the Roosevelt School District to replace lost or damaged trees, to provide professional development for staff, and to create educational material for children such as coloring books that highlight why desert trees are so special! We hope you will follow us (and join as a volunteer) in the following year as we show others why Trees Matter! 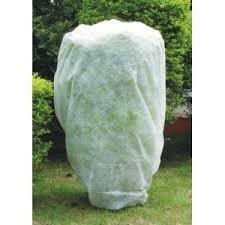 Cover your trees with a sheet, light blanket, or burlap sack. Hardware stores sell sheets made of light, porous material specifically for frost protection but feel free to use whatever you have on hand except for anything made of plastic. Plastic traps moisture in and can damage the tree (the captured moisture can turn to frost). Also, thick blankets or covers can soak up moisture, become heavy, and press down on the tree. Ideally, you want the cover to touch the ground to retain the warmth under the cloth and around the tree (refer to the picture on the right and the diagram below). Remove the cover later in the morning when there is full sunlight and preferably when temperatures are warmer. Some of the coldest temperature occur at daybreak so if you can, wait a bit. Do not leave trees covered all day as this can damage them. If your tree gets frost bitten, do NOT trim the damaged parts as they still provide protection for the remaining living parts of the tree. Wait until the spring or when you regularly prune your tree. Make sure to water your trees regularly during winter. Dehydrated trees are more susceptible to frost-- frost damage occurs when ice crystals form on the leaf surface drawing moisture from the leaf tissue so if a tree is already dehydrated, the additional dehydration damages or kills it. Wet soil also absorbs heat during the day so water your plants in the morning and do not overwater. 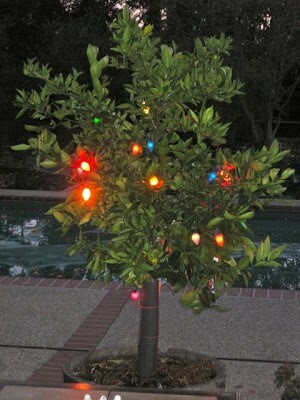 Refer to our blog on How to Properly Water Your Trees. Place mulch around deciduous trees (like our shade trees) to prevent them from breaking winter dormancy by insulating against fluctuating surface soil temperatures. However, do not place mulch around citrus trees, as it will hinder the capturing of heat that will protect the plant. If your tree is damaged or you have other questions, feel free to post them on our ask the arborist forum here. It is important to water trees properly, as this is often the most common reason for leaves drying out, especially with young trees. When you receive your trees, check the moisture of the soil in the container it comes in. It should have the moisture level of a wrung out sponge, moist but not soggy. Too much water can be as bad as not enough. Sometimes between the time we receive trees from nurseries and the time we distribute them, the trees may have dried out so check to see if you need to water them right away. Once you plant your tree, it is important to water them DEEPLY, down to 2-3 feet. Refer to our blog on How to Properly Water Your Trees for a watering guideline table. You might also want to invest in a soil probe to detect how deeply the water is penetrating, which you can find in most hardware stores. 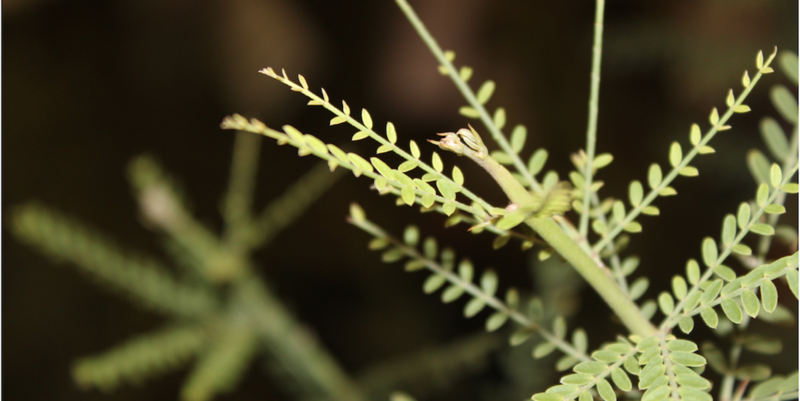 Pictured right is a Willow Acacia that is showing signs of dehydration—the leaves are starting to curl and crisp up, as well as turn brown-gray. Once the owner began watering more often and deeply, the tree recovered. Trees are very resilient—don’t give up on it if you start to see signs of distress. Try watering it more often and remember: moist but not soggy soil. - Make sure there is good soil contact on the roots. Lightly tamp the soil around the base of the tree with your foot. Don't stomp, but firmly push down the soil to make sure the root ball has good contact. - Do not cut the roots when you plant trees—they store important carbohydrates, nutrients, and hormones necessary for tree growth. Sometimes, though, we recommend scoring the roots if they are overgrown. - Water the tree once it is in the ground, even after it has rained and the soil is wet. This will help attach fine root particles to the roots. If your tree does show signs of transplant shock after you plant it--like dropping its leaves or appearing droopy--scratch the bark with your finger nail to see if there's green underneath the bark. If the small branches are pliable and green, be patient. The tree will likely produce new growth in a week or two. Water normally. And remember--moist but not soggy soil. If you notice leaves on your tree one day and the next day find it stripped of them—or denuded—hungry wildlife is most likely the cause. Rabbits are common culprits of denuding so make sure to read our blog on How to Keep Rabbits Away from Trees. While the chance of a tree surviving an “attack” by an animal can be dependent on the species and age, most trees young or old can survive a single incident of defoliation (the loss of leaves). If your tree becomes denuded by an animal, water the tree as if it has leaves, don't over compensate. If it occurs in the heat of the summer, try shading the tree until the new leaves reach maturity. And remember—dogs also love to “play” with new trees, so read about ways to keep Fido away from your tree. If you have a tree situation, feel free to post your questions on our ask the arborist forum and our certified arborist will answer them! This past season we received questions from new tree owners concerned about the wildlife that was eating the leaves off their saplings. In particular, hungry rabbits are becoming more common especially with increasing home development throughout the valley. 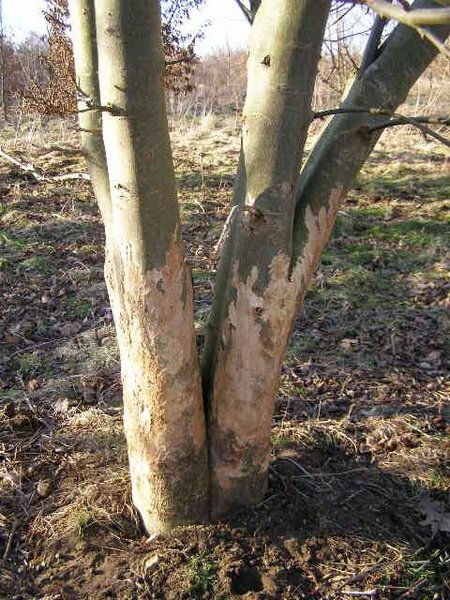 The most common tree damage attributed to rabbits is denuding-- or eating the leaves off of a tree-- and bark stripping, or eating the ripe green layer just beneath the bark particularly during the winter when food is scarce (pictured right). 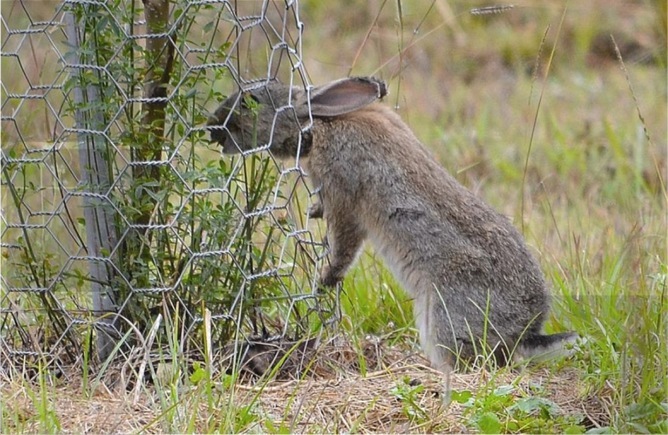 The most effective way to prevent rabbit damage is to place chicken wire fencing around the tree(s). It is important to place the fencing far enough away from the tree so rabbits cannot get to the leaves through the fence, but not so far and low that they can jump over and fit between the fence and the tree. Also, try and place the bottom of the fence 3-6 inches underground so rabbits so do not go under the fence and reinforce the bottom part with extra wire to make the openings smaller (refer to the example below). You can place tree trimmings outside the fencing area to serve as a decoy food source during the winter, as rabbits favor twigs and buds over tree bark. Repellants can also be used as odor and/or taste deterrents. 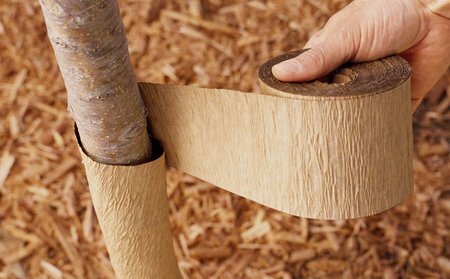 To protect against bark stripping, you can temporarily place protective wrap around the trunk and low branches of your tree (pictured right). What happens if your tree loses all its leaves due to rabbits? Most mature trees can survive a defoliation and young trees can survive a single incident. If you haven’t already, place fencing around the tree as described above. Water the tree as if it has leaves, do not over compensate for the missing foliage. If it is in the heat of the summer, shade the tree until the new leaves reach maturity. If your tree does get damaged by rabbits, feel free to post your questions on our ask the arborist forum or advice. And if Fido won’t stay away from your young trees, check out our blog on how to keep dogs away from trees. 1. Calculate the value of old and large trees. You can hire an arborist to perform an estimate or use online resources such as this tool and this resource. Remember to take pictures of the tree. 2. Call your insurance company and request an appraisal of live assets. Live assets insurance can cover, for instance, if a neighbor accidently kills your 80 year old oak tree from chemical fertilizer run-off. Calculating the cost, beforehand, of the tree will increase the chances of receiving fair coverage versus receiving the cost to replace it with a 48" box tree. 3. Most homeowner’s insurance policies cover tree removal and damage repairs for your home and other insured structures, such as fences, but double check by calling your insurance claims department. If a tree is not maintained (pruned) and falls due to neglect, you could be responsible for the damages. Read our blog on how to protect your trees from monsoons for tips on keeping trees in good condition. 4. Know the policies of your insurance company by calling them or looking them up online, such as sites like this. Generally, most insurers limit the coverage to $500 per tree or 5 percent of the amount of insurance on the structure of the house. Many times trees damaged during a storm are salvageable if you take the proper steps--read our blog on what to do if your tree gets blown over in a storm or post questions on our ask the arborist forum. If your tree, however, is damaged beyond repair, insuring your trees can help prevent expensive costs. Removing a tree during the thunderstorm season may seem like a good idea now, but come summer you’ll miss the cooling shade it provides! 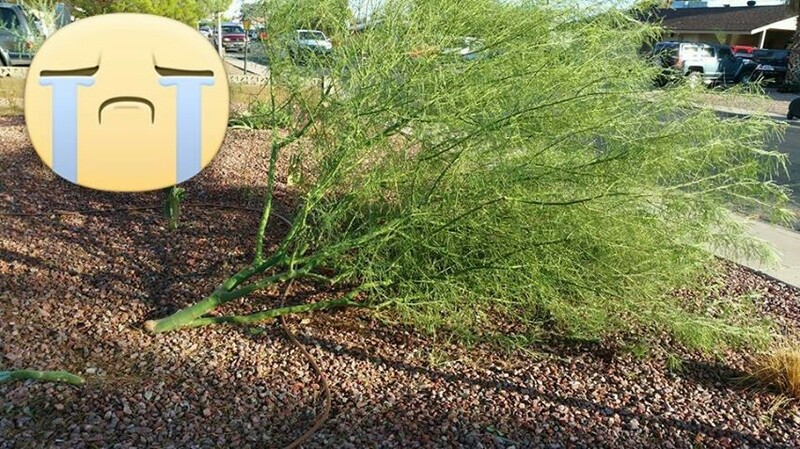 This week severe thunderstorms ran through the valley and, unfortunately, damaged many trees. 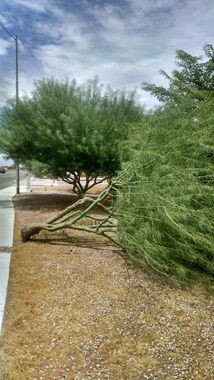 To the right are pictures emailed to us from a customer whose two year old Palo Verde was uprooted this past weekend. She, rightly, immediately contacted an arborist and posted her situation on our ask the arborist forum. Unfortunately, our volunteer certified arborist assessed that because the trunk had ripped from the roots, the tree was most likely unsalvageable (sorry!). Young trees are very susceptible to being uprooted from strong winds. Even if you take all the preventative measures for your trees, damage can still occur. While wind helps strengthen a root system (think resistance training for trees), if roots are still developing the strong pulling can prove too much, too soon. Cover any exposed roots with soil so the tree doesn’t dry out. Trees can survive laying on its side as long as the roots are intact and don’t dry out. If the tree is small, you can replant it. This means removing the tree completely from the ground, re-digging/shaping the hole, and positioning the tree in it. Next, stake it and make sure the stakes are set in the surrounding undisturbed soil. If the stakes are in the same hole with the roots, they'll likely get pulled over by the tree if it falls again. Large trees can be more difficult to save. If the entire rootball has heaved up or the trunk has detached from the roots (like what happened in the above photos), the tree most likely is unsalvageable. The best thing to do is consult an arborist immediately. You can locate consulting arborists here: http://www.asca-consultants.org/find/directorySearch.cfm or perform a Google search on “consulting arborist.” Although they will charge you to come assess the tree, it is less expensive than replacing a tree that can be saved. Post your questions (and photos if possible) on our ask the arborist forum where our certified arborist will answer them. As you prepare for the next thunderstorm (Thursday? ), keep these steps in mind and remember that many trees can be saved if you act quickly! 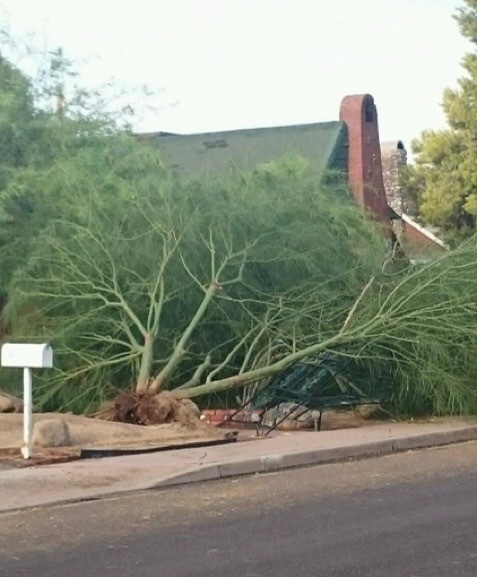 This past week we received emails from people wanting to replace trees that were uprooted during a storm so we figured it’d be a good time to review the ways you can protect your trees from monsoon damage. Monsoons in Arizona typically occur between June 15th and Sep 30th. Violent winds due to a sudden shift in speed and direction account for most of the damage incurred to trees (the word monsoon means “wind shift”). Preventative tree care like properly pruning and watering your trees is the best line of defense against monsoon damage. Overgrown and top-heavy trees--due to improper or lack of pruning-- are typically the ones that split during storms (pictured below). It’s best to have an arborist assess your pruning requirements in May and June, before the onset of monsoons, and prune as needed. Performing routine pruning maintenance on your trees after the first year of growth is important in order to protect them from storm damage and to promote healthy tree growth. 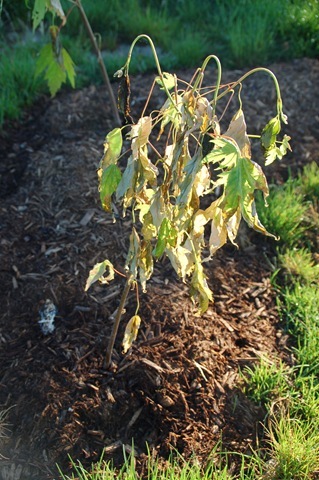 Light trimming and the removal of dead limbs can be done throughout the year but major pruning during winter dormancy is the most common practice as it leads to a burst of new growth in the spring. However, do not prune during the coldest months or temperatures. It is recommended not to prune trees during the fall because tree wounds seem to heal more slowly and decay fungi release their spores during the fall. Ideally, trees should be thinned to no more than 20% of the canopy size and 80% of the area pruned should be new growth on the outer third of the canopy. Refer to our blog on How to Properly Prune Your Trees for more information and guidance. Equally important as pruning is to properly water your trees. Along with violent wind, monsoons bring heavy rain which can over-saturate the soil around a tree and make the tree vulnerable to strong winds and uproot them (pictured right). 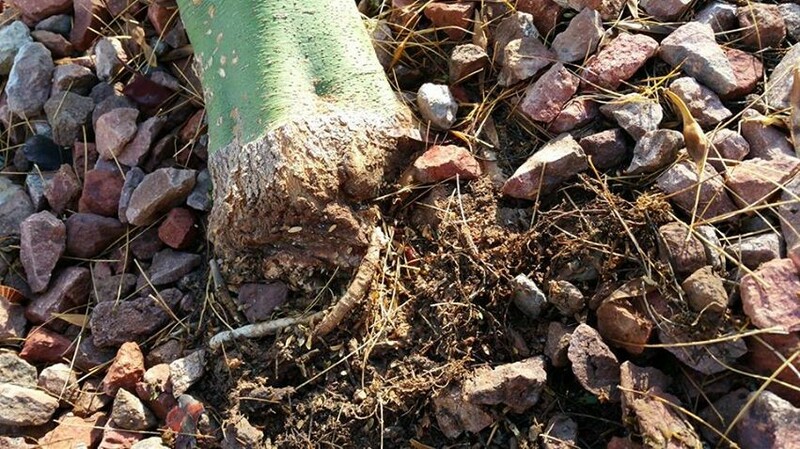 Although old trees with healthy root systems can still be yanked up by monsoon winds, there are things you can do to strengthen a tree’s root system and increase its chance of surviving a storm. 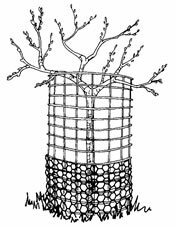 The first two to three years after planting a tree are critical to developing a well distributed root system. 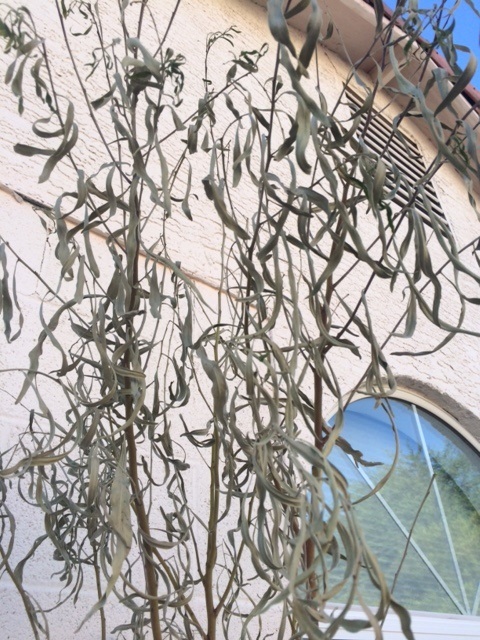 Deep irrigation (2-3 ft) during the spring and summer help desert-adapted trees resist the damaging effects of high winds. Once the monsoon season begins, however, resist the urge to soak your trees as they uproot more easily in soft, wet soil and less water is needed since trees retain more water in high humidity. It is often recommended to minimally water desert-adapted trees after 3-5 years of growth and once a well-established root system is formed. Additionally, making trees "seek out" water and nutrients by placing irrigation emitters around the outer edge of the tree’s canopy (called the drip line) will help develop a more dispersed root system and reduce the risk of wind throw. Properly watering a tree can also prevent the tree’s canopy from growing too quickly and rendering it top-heavy. Refer to our blog on How to Properly Water Your Trees for more information. Add mulch and fertilize to your trees consistently and adequately so they grow healthy and are better prepared to withstand the monsoons. If a tree becomes uprooted or damaged during a storm, most trees can be reset if corrective action is taken within a few hours. If your tree does get damaged during a storm, feel free to post a question on our forum here or find an arborist in your area. And remember--the cost of tree damage prevention is a fraction of the cost of tree damage replacement. As people plan for September when we begin distributing trees again, we are often asked what trees are best to select and where to place them. While the shade tree staff can give general guidelines, we like to refer to our ask the arborist forum or inform customers that a certified arborist will be at the workshops. Instead of referring to a landscaper with tree related questions, we encourage customers to contact a certified arborist. Sometimes there is confusion between a landscaper and an arborist so we thought we’d explain when it is best to hire an arborist versus a landscaper. In our last blog, we briefly discussed what an arborist is and the different certifications they can obtain. We mentioned some of the areas that arborist are trained in such as pruning, pest and disease management, tree removal, and the proper selection and planting of a tree. Arborists specialize in tree care and are knowledgeable about the specific needs of trees. Hiring an arborist to help care for your trees can lead to significant returns. Not only do well-tended trees increase property value, but well-cared for trees can also prevent damage to your property (fallen limbs, uprooted trees) during Arizona thunderstorms. While the difference between a landscaper and arborist may seem obvious, it is important to know when to hire one versus the other. Conventional landscaping includes services such as landscape design and installation, lawn care, lawn irrigation installation and maintenance, garden care, and shrub pruning. Arboriculture, however, involves caring specifically for trees such as tree selection and placement, tree planting, tree removal, pruning, cabling, stump grinding, and other emergency care services. Landscapers may not be equipped with the training and tools needed to properly care for your trees. Pruning large trees can be difficult and dangerous and it is important to hire a properly trained person, such as a certified arborist. Not only can improper pruning damage your trees but a homeowner can potentially be liable for personal damage to a landscaper if they do not carry liability insurance. So when is hiring an arborist a good idea? As a rule of thumb, if the services required revolve around tree care, consult an arborist. The International Society of Arboriculture (ISA) provides online resources to find an arborist and to verify an arborist’s certification (pictured below). While the online search tools are not inclusive of all the arborists in your area, it is a good starting point to locate or verify one. Some landscaping services might offer a certified arborist on staff or be able to recommend one to you. While landscapers and arborists differ in their specialties, taking advantage of their complementary services can ensure that you properly care for your yard. And remember, you can always post your own questions to our volunteer certified arborist here. This week we thought we’d explain what an arborist is and the different types of certifications, since we often receive questions about tree care and we like to refer those questions to our ask the arborist forum. An arborist is a person trained in the art and science of planting, caring for, and maintaining trees. Arborists are knowledgeable about the needs of a wide variety of tree species and are trained with the proper techniques to care for trees (such as pruning, pest and disease management, tree removal, proper selection and planting of a tree, and tree soil fertilization). Certified arborists are individuals who have attained a level of knowledge through experience and by passing a comprehensive examination developed by some of the nation’s top experts on tree care. Certified arborists must also continue their education to retain their certification and must adhere to a Code of Ethics. The International Society of Arboriculture offers ISA certification to those who would like to voluntarily undergo the process in order to measure their knowledge and competence required to provide proper tree care. ISA certification is not government-sponsored or government-endorsed but rather a way for tree care professionals to show their commitment to the industry. · Arborist Utility Specialist: 2,000 hours experience over two years in electric utility vegetation management or has served as a consultant to a utility, with a minimum of 4,000 hours over a maximum 10-year period. They have been tested on topics such as electric utility pruning, program management, integrated vegetation management, electrical knowledge, customer relations, and storm response. · Arborist Municipal Specialist: current ISA Certified Arborists® who have chosen municipal arboriculture or urban forestry as a career path. They have obtained a minimum of three additional years of work experience managing the establishment and maintenance of urban trees. · (Tree Worker) Climber Specialist: must have the skill and endurance to climb trees, demonstrate high regard for safety, and be able to get the job done off the ground. This credential is different from the other certifications because you tested in both a classroom setting and a field setting. Candidates must have training in aerial rescue, CPR, and First Aid to obtain this certification. · (Tree Worker) Aerial Life Specialist: certification requires candidates to demonstrate their ability to perform as a competent aerial lift operator. The knowledge gained with this certification can improve the productivity, quality of care, and safety practices of those who earn the credential. · Board Certified Master Arborist: the highest level offered by ISA; in addition to passing an extensive scenario-based exam, candidates must abide by a Code of Ethics, which ensures quality of work. Fewer than two percent of all ISA Certified Arborists® currently hold this certification.